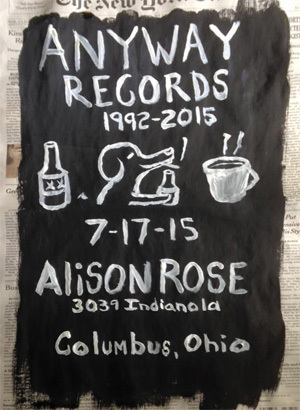 This Friday, July 17, as part of its Art at the Stroll series, Alison Rose will celebrate the opening of an exhibition celebrating the history of Anyway Records. This unique collection features original hand-painted posters, fliers, handbills, and other memorabilia that Anyway founder Bela Koe-Krompecher has collected during his 20-plus years of running the label, many of which he created himself to promote the shows he booked during the ’90s. As part of the festivities, Kyle Sowash (of The Kyle Sowashes), Sean Gardner (of Winter Makes Sailors), and Chris Forbes (formerly of Orchestraville) will perform. Additionally, Anyway Records t-shirts will be printed during the event. The opening takes place from 5pm to 9 pm, and the exhibition will be on display until August 14.